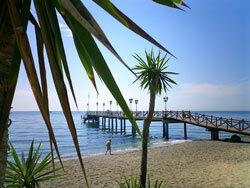 Marbella is situated 50 km west of Malaga. During this 1950, this former trading town has been developed into a luxury resort for the international jet-set, film stars and millionaires, kings and princes. Well known are therefore the so called "Golden Mile" and Puerto Banus, the port of Marbella, where dock in the most luxurious yachts. In this quarter are situated exclusive shops and restaurants, a marina and lots of places to visit. You can find highest standards within reach, exclusive developments and night clubs, five star hotels, a wide range of golf courses, several marinas and well maintained beaches with fashionable beach clubs. Related information to Marbella and the Costa del Sol, pictures, blog and Forum.